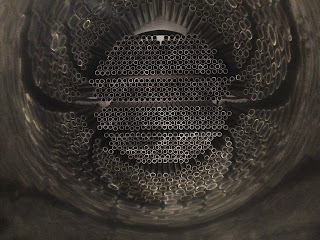 We just completed, on schedule, (6) specialty shell and tube heat exchangers for a nuclear application. This very interesting project utilized electropolished shells (and bundle components) to an average roughness (Ra) of 3 micro-inch. Putting this value in perspective, the hot rolled HRAP TP304 stainless steel (No1 finish with approximate Ra of 40 micro-inches) was polished into a surface as smooth as glass. Electropolishing is an electrochemical process that removes material from a metal part to passivate, deburr, and create a very smooth microscopic featureless surface. That is one shiney shell! Really cool project.